FineWoodworking offers expert advice on woodworking and furniture making, with thousands of how-to videos, step-by-step articles, project plans, photo galleries, tool reviews, blogs, and more. for the do it yourself boat builders. strip built or stitch and glue boats. For the best quality hand tools. A member of the MBright Group of Companies, MBright Tools IVAC Inc. is a Canadian company dedicated to the design and development of a growing series of products related to the automated interface between power tools and associated dust control systems. Marketed under the "iVAC" brand, the prime objectives are products to improve work shop safety with respect to the operating of potentially dangerous power tools, the ingestion of hazardous dust and in work shop operational convenience. Matt is an occasional instructor at CVSW. His specialty is making hand planes. See his website, www.msbickford.com and his blog Musings from Big Pink. Matt is a professional hand saw sharpener, hand tool woodworker and saw enthusiast who has been using and sharpening hand saws since 2002. As the SawWright, Matt offers everything from saw sharpening to complete restoration and repair of saws old and new. He teaches saw filing, restoration and saw building at several woodworking schools around New England, including CVSW, and is also currently working on a new line of custom made handsaws. 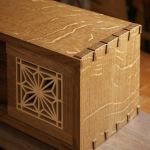 Thesawblog.com chronicles Matt's work as The SawWright and serves as the only site on the web dedicated to all things hand saws. He can be reached at matt@thesawblog.com. Collecting and dealing in antique hand tools. Maker of hand tools and replacement parts such as hand plane totes and knobs. Also see the Plane Shavings Blog. In addition to the artistic work that is turned in the on site, Studio Fifty-five, LLC offers specialized instructional classes for people with all levels of turning skills. Swamp Road Wood Works is a one person woodworking shop located in the Berkshires of Western Massachusetts in the hilltown of Worthington. SRWW is the home of Chiefwoodworker (aka Joe Zeh) and Chiefwoodworker's Blog. Woodworking, one of 4 Manchester attractions listed on TripAdvisor. and developing technology for woodworkers.